One may ask why on earth we need another materia medica, while so many of them exist in the literature. The fact was that, during my course of Homoeopathic studies, I found to my great annoyance most of them describing the symptoms of the remedies in the traditional 'head to toes' format, without any logic. As I am someone who cannot learn by rote, I had tremendous difficulty memorising them. Luckily though, I came across a textbook by Dr Douglas Gibson entitled 'Studies of Homoeopathic Remedies', describing them in some sort of physiological manner, which was very helpful for me to rewrite the remedy pictures and learn them easily. 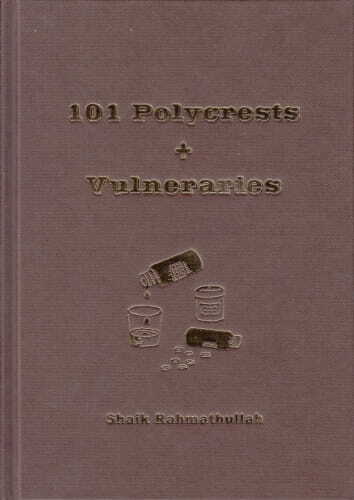 After graduating, I promised myself to write a new style materia medica of major remedies, and the result is '101 Polycrests + Vulneraries'. Although somewhat similar to Dr Gibson's, my book is substantially different in the description of remedy pictures. Starting with the study of pharmacology, clinical features, and general characteristics of the considered drug, the book follows the remedy's external aspects, and the physiological, systemic and psychological symptoms, as though a practitioner is taking down a case history of a patient. At the end, remedy relationships and some therapeutic hints are expressed. In traditional textbooks, mental symptoms are described at the very beginning, giving them predominance over physical symptoms, most probably from the prevailing belief of mind over matter. It is true that strong emotions can cause some physical complaints, as for example intense fear can induce urging to stool or involuntary urination. But then, it is equally true that physical complaints can affect the mind, as for example fever brought on by other sources can cause anxiety and fear. I therefore decided that it is best to deal with the psychology at the end rather than at the beginning. Besides when taking a case, no homoeopath in his right mind would start to probe the patient's mental/emotional state, unless the complaint is psychological. My work does not claim to offer new symptoms of the remedies, nor does it speculate if there are any. It is basically a compilation of the remedy pictures, extracted from the writings of past and present masters, and exposed in a new style. The book restricts to the major remedies usually taught in colleges of homoeopathy, leaving out lesser polycrests, and also Bowel Nosodes, as they could always be found in other textbooks if necessary. On the other hand some minor remedies known as Vulneraries are dealt with in a chapter at the end, as they are priceless remedies for the treatment of specific injuries, wounds, bruises, burns, scalds, and extravasations. The book is primarily intended for the students of homoeopathy, who find it hard to absorb the symptoms of the remedies that had been expressed in the 'head to toes' fashion, and also for those who want to explore a different style of materia medica. At the same time, teachers of homoeopathy might find it an easy to use reference textbook of materia medica.